Season three of The Walking Dead got off to a great start. We were in a new location, Rick had lost himself, and some cool new characters were introduced. The Governor (David Morrissey) and Michonne (Danai Gurira) were highly anticipated additions to the series. After a tension-filled first half, the remainder of the second season started to falter. The storytelling became unfocused and monotonous. The prison group pitted against Woodbury plotline was stretched to the limit (and then some). All the while we knew everything was leading to a faceoff between Rick (Andrew Lincoln) and the Governor. At least that’s what we thought we were getting. The season finale, “Welcome to the Tombs,” took some unexpected turns. While the episode was not everything I was hoping for, it had a lot of great moments. Remember that Andrea (Laurie Holden) was left tied to a chair in some back room with a bunch of surgical tools at her side? Well, she’s still there. The Governor knows Milton (Dallas Roberts) is the one who barbequed the walkers in the pit, and he takes out his revenge in the opening scene. After beating Milton’s face in, he tries to force him to kill Andrea. When Milton refuses, he stabs him in the gut and leaves him to die. He parts ways with the message “In this life you either kill or you die, or you die and you kill.” As Milton waits to die, Andrea tries to escape by means of a pair of pliers Milton had secretly left for her. All she has is her bare feet to pick them up, thus a slow game of “will she make it in time or not” begins. It’s kind of a comic book thing to do. I mean, the Governor could have just killed Milton outright. Milton would have turned right away and Andrea would not have had time to escape. I guess he wanted to torture them both first. Given Andrea’s tenacity, I would have thought he wanted to make sure she died, but maybe he was just too arrogant to see it any other way. It worked pretty well for the story, since it was drawn out for the entire episode. 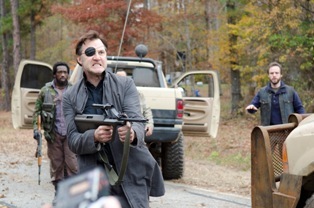 After the Governor leaves Andrea and Milton, he gathered the townspeople for a full scale attack on the prison. For anyone expecting a war, you didn’t exactly get one. The gang rigged the prison with booby traps, and hid out with shotguns in a sneak attack. Getting more than they bargained for, the folks of Woodbury got out of there in a hurry. I thought it seemed a little too easy, but one thing to keep in mind is that most of the people of Woodbury were just ordinary folks who had been blinded by the charm of the Governor. They had been led to believe they were protecting themselves by attacking the prison. In one of the most shocking moments of the entire season, the Governor took out his disappointment by mowing everyone down in cold blood. Even for the Governor this was completely unexpected. He seemed to take so much pride in lording over everyone, and now the only people he has left are his main two henchmen. One of the themes of this season has been Rick going back to the man he once was. For a time, his only motivation was protecting his family, but he lost his humanity in the mean time. As he slowly gains it back, it turns out Carl (Chandler Riggs) has lost it. While the prison raid is happening, Carl is hiding out in the woods with Hershel (Scott Wilson), Beth (Emily Kinney), and the baby. This was a task Carl was incredibly angry about. He wanted to be back at the prison fighting off the enemy. 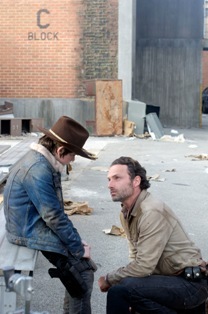 The sad thing is that it’s not just that Carl wants to help, but that he seems to get a thrill out of shooting people. He feels it’s his purpose in life. This leads him to murder a young man who has stumbled across their hideout. While Carl maintains that he was just protecting everyone, it seems clear he did it in cold blood. So the story wraps up with Rick finding himself once again. His visions of Lori (Sarah Wayne Callies) disappear, at least for now. I kind of thought they would do a little more with her ghostly visits, but she pretty much just stared at Rick from a distance. Rick has a new problem on his hands: Carl. Carl has no love for anyone anymore. Perhaps it’s because he’s afraid of losing someone he cares about. Maybe he’s just turned cold due to the circumstances. Either way, he’s become dangerous. The governor is still at large, with his two henchmen. I’m sure he’ll figure in prominently next season. The big loss this episode was Andrea. She managed to get out of the chair and kill walker Milton, but he bit her. 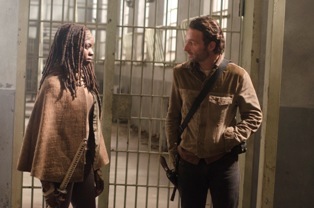 Rick, Daryl, and Michonne find her just in time to say their goodbyes and make amends. One thing I’m looking forward to next season is seeing more of Tyreese. 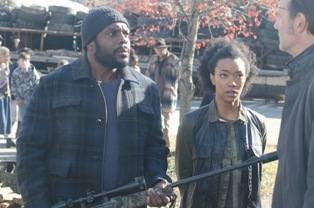 He and his sister (Sonequa Martin-Green) had stayed behind in Woodbury because they didn’t agree with the Governor’s actions. Now he has joined forces with Rick and is back at the prison. Daryl and Michonne both came through unscathed. In fact, they were a little underutilized this episode. I had thought there would be a little more fallout after Merle’s (Michael Rooker) death, but Daryl seemed focused on helping Rick. He did have a nice conversation with Carol (Melissa McBride) about Merle’s redemption. Glenn (Steven Yeun) and Maggie (Lauran Cohan) also both survived, which was kind of a surprise to me. I thought for sure one of them would get killed during the skirmish. So everyone is back at the prison, which I have mixed feelings about. I’m kind of tired of the prison. I was hoping they would move on. Of course, it’s entirely possible that they will. At this point they have taken in all the orphaned children and elderly of Woodbury, so they have an entirely new dynamic on their hands. I don’t know that it’s all that exciting of a dynamic, but it is different. I’m hoping for something really new next season. I’m also hoping for more zombie excitement. The walkers have taken a backseat this season, and it’s time to bring them back. Maybe they can add some kind of new twist to the infection. The Walking Dead is scheduled to return for season four in October. I didn’t get to watch the season finale until a few days after it originally aired. Tried very hard to not get exposed to spoilers. Only thing I heard before I watched it was that it was kind of a letdown. I agree somewhat, but I did enjoy it. 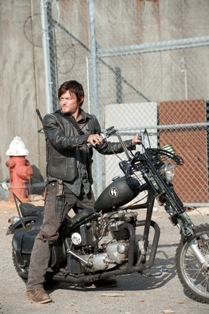 Cried like a baby for Daryl when he had to kill zombie Merle. Michael Rooker is a fantastic actor & I’m glad to see he got to redeem himself before the end. All in all, yeah it could have been better but all the people I wanted to stay alive did. How long is before October? ?